To encourage the CEEBJ community to engage with Jewish values of social justice through study, action and advocacy. We will continue to work closely with Tikkun Ha-Ir of Milwaukee and other social justice organizations. We will also continue to look to the Union for Reform Judaism’s Commission on Social Action and their Religious Action Center for guidance, tools and leadership. Meetings are once a month on Sunday mornings at 9:45. Please contact the Synagogue Office for the next meeting or check the website calendar. Guests and new members are always welcome. Sandwich Day – the second Wednesday of each month wherein congregants make sandwiches which are donated to the Guest House Shelter. The materials are purchased through the fund. Donate $36.00 to our Bimah Basket Fund. Your donation will be acknowledged with a sign next to the Bimah Basket at the entrance to the sanctuary, in the service bulletin for Shabbat, and in HaKol. The money will be directed to the Jewish Community Food Pantry. 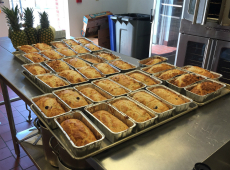 On December 25 and at other times during the year, our congregants put together meals to be served at the Guest House, the city’s largest publicly funded shelter for homeless men. Each year for the High Holy Days we coordinate a food drive that supports the Jewish Food Pantry and Hunger Task Force. 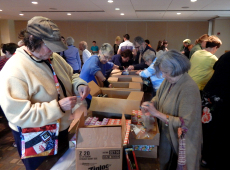 A Jewish Response to Hunger: Every year at the Rabbis and committee make a public appeal for people to make a donation to this important Jewish fund. We also ask people to consider making a donation of 3-5 % of the cost of food for their personal celebrations to MAZON. CCEBJ has played a leading role in Tikkun Ha-Ir. 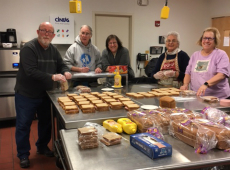 This organization– whose name literally translates to “repairing the city” – encourages the local Jewish community to support their activities to help Milwaukee homeless hungry and homeless families. Every year our congregation coordinates a blood drive with the Blood Center of Wisconsin. Anyone who is 17 years or older, is generally healthy, and weighs more than 105 pounds is encouraged to donate. From the end of November through the third week of December we collect winter clothing to be donated to COA (the Children’s Outing Association) and for their preschool reading program HIPPY. Each year we participate with other Jewish organizations in the community in a Mitzvah Project or we have our own Mitzvah Crib program to donate new or gently used baby and toddler supplies to Penfield Children’s Center, the Cathedral Center, and other social service agencies. Every year we fill up a bin in the coat room to donate kosher food to the Jewish Food Pantry. Twice a year, in coordination with Tikkun Ha’Ir, we collect new and gently used clothing and household items to be donated to a number of social service agencies in the community. Our congregation proudly displays our beautiful Sol Dorf Tzedakkah box in the foyer of our building. The recipient of funds changes each month. Every May, our building is transformed into a workhouse of variety of volunteer jobs that are delivered to community agencies. 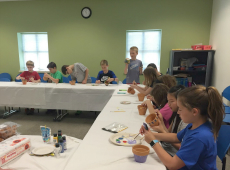 Activities for kids, families and adults- please join us in a group project that is later delivered to the local Milwaukee non-profit. We always need delivery people to represent CEEBJ and deliver our donations.